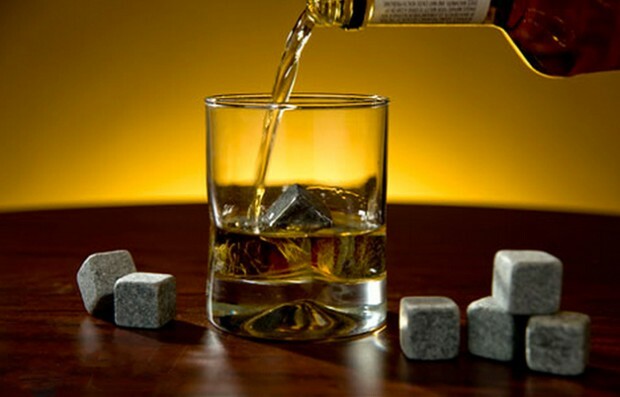 I keep seeing a lot of these “whisky stones” in the store. They’re cube: shaped rocks that are supposed to be great keeping my drink cold without diluting it. Are they the real thing? Sure, kinda. Those cubes are made from soapstone, and the idea is to put them in your freezer and then toss them into your drink instead of ice cubes. But people don’t just put ice in their whisky to keep it cold. That extra water is supposed to open up the flavours and aromas. A whisky stone won’t do that. And some people actually want the whisky diluted a bit, for various reasons. A whisky stone won’t do that, either. If you simply want to keep your whisky neat and chilled, then the stones are a decent alternative to ice. I prefer to use metal whisky stones, myself. I find them easier to clean and think they stay cold longer. Just a side note: I don’t think anything will keep your drink cold as well as ice does, but I like my drinks cool and neat.